You may be familiar with particles of light, called photons. Physicists give the name “prompt photons” to those that are produced by two particles smashing together — hard collisions — as contrasted with those resulting from the decay of other particles. The Tevatron produced prompt photons by the hard collisions between protons and antiprotons. Knowing the likelihood that proton-antiproton collisions will produce prompt photons tells us something about the proton’s components, which are called quarks and gluons. In particular, we can learn about the density of quarks and gluons inside the colliding protons and get a better grasp on how they fragment into photons. These ingredients are all described in a theory called perturbative quantum chromodynamics. The cross section is presented as a function of the transverse energy of the photon. This plot compares three models — Pythia 6.216, Sherpa 1.4.1 and MCFM 6.8 — to the data. Prompt photons at hadron colliders constitute an important test of perturbative quantum chromodynamics (pQCD), and may also be found in signatures of new physics processes. A precise measurement of prompt photon production is important to probe theoretical models, as well as to gain a better understanding of final states that contain energetic photons. 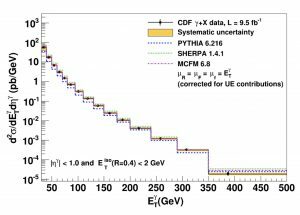 CDF physicists used the full Tevatron Run II data set, which contained 2.1 million collision events in the selected sample, to measure the prompt photons’ energies. The researchers were particularly interested in the energy they carried in a direction perpendicular to the colliding beams, a property called transverse energy. The photons’ transverse energy tells you something about the process that produced it. Photons with less than 100 GeV of transverse energy were generated primarily by quarks and gluons scattering off each other. At higher energies, the dominant process was the annihilation of a quark with its antimatter counterpart. CDF conducted a similar study to this one in 2009. An important part of the measurement is that the photons should be isolated (the energy deposited near the photon is small). This time, a larger data set meant scientists could study a larger range of transverse photon energy, from 30 to 500 GeV. Moreover, a different statistical technique has been developed to better identify prompt photons; their identification is very challenging because of the huge background coming from other particles (mostly hadrons). The results are presented in the first figure: The likelihood of proton-antiproton collisions producing a prompt photon decreases with increasing transverse energy. Note the data covers six orders of magnitude. This provides a challenge for theorists to come up with models that predicts this behavior correctly over so large a range. Over the full range, data shows good agreement with the MCFM prediction. 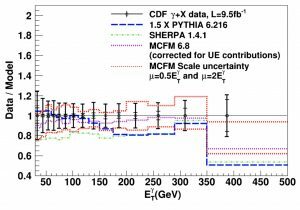 This model is a next-to-leading order pQCD calculation developed by Fermilab physicists John Campbell, Keith Ellis, Walter Giele and Ciaran Williams.